I(and my team of reviewers have) have tried a number of Meaningful Beauty products in the past and have been impressed beyond our expectations of them so I was really pleased to be asked to perform another Meaningful Beauty review, this time of their brand new Meaningful Beauty Wrinkle Smooth Capsules because, as I mentioned recently, I love the idea of capsules – they mean you can't under or over use a product. The first thing I found was that the capsules are a lot more robust than others I have tried. By that I don't mean that they are hard to break open (in fact, they are just about the easiest twist-and-pull facial capsules I've ever tried) but more that they have withstood the test of atmospheric moisture levels better than most. Many capsules made from natural or near-natural ingredients tend to perish once the jar or packet is opened and stick together. The Meaningful Beauty capsules don't stick together. The contents of the capsules is a thick opaque lotion which looks and feels remarkably like the Meaningful Beauty Glowing Serum! That tiny bead of lotion that comes out of the capsule is easily enough to cover your whole face. It is hard to put into words the feeling your skin has shortly after using the Wrinkle Smooth Capsules. My skin feels velvety as I run my finger tips over my cheeks and neck. It feels, for a few minutes, as if it is totally and utterly perfect – its such a surreal feeling of perfection that it is ever so slightly disconcerting! The silky sheen disappears after about 10 minutes but it still leaves the skin soft to the touch for quite some time after that. As regards to the capsule's wrinkle-smoothing effectiveness; well, its hard to say. I think that the skin around my neck is feeling more hydrated than normal since I've been using the capsules but I'm in this for the long term. One jar contains 60 capsules and I'm using them every other day – for me I'd hope that they acted more as wrinkle-prevention and so far, so good! 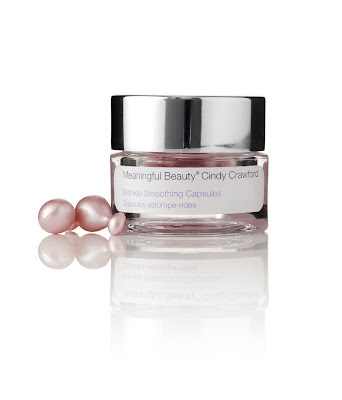 You can buy the Meaningful Beauty capsules straight from their website for £29.95.